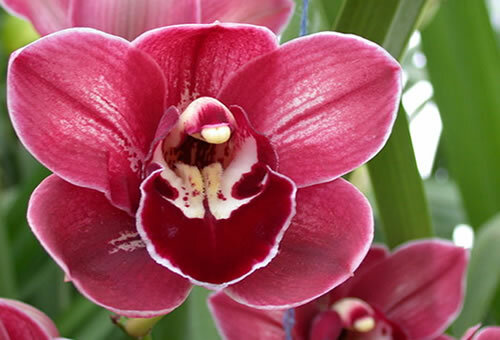 Cymbidiums are sometimes known as boat orchids, their name is pronounced ‘SIM-bid-ee-um’. It comes from the Latin Kumbidion which means little boat, referring to the shape of the flower. They became popular in Europe during Victorian times, and are now one of the most desired orchids in the world. They are prized for their beauty, bright colours and lasting qualities. They withstand cooler temperatures than other tropical plants and are ideal houseplants. Plants can have up to 15 flower heads. The flowers have a waxy texture and can last up to ten weeks. They require lots of light and regular watering, to keep the soil moist. They like humid conditions so regular misting helps them too. Providing they like the conditions they will continue to flower year after year. 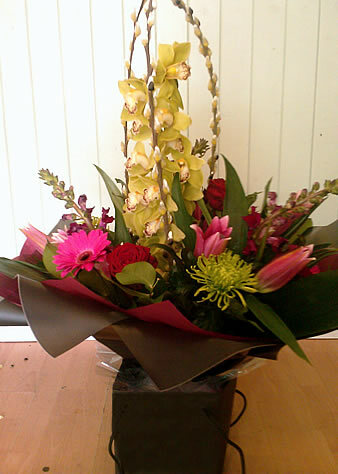 Cymbidiums are also very popular as a cut flower; they add a tropical luxurious feel to any bouquet. They range in size from 30cm length stems with lots of very small heads, to 90cm with 10 or more large heads. A single stem makes a lovely gift, wrapped simply with a little foliage or grass. 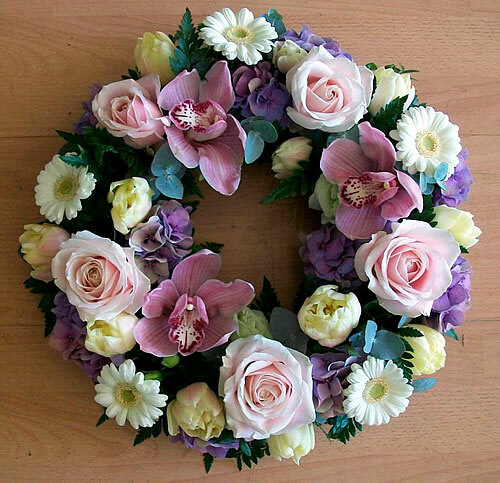 They are mainly available from October to June and last from 2 to 4 weeks as a cut flower. Large stems make an impressive focal point in bouquets and arrangements, they often out last other flowers in a mixed arrangement. Large heads are big enough to separate and use individually in small water vials. They are frequently used in bridal work as they come in many beautiful colours and are very versatile. The individual heads can be wired and used in bridal bouquets , corsages or table arrangements.